Inconveniently placed hair dryers in every single hotel. Overly complicated but ineffective European plumbing — toilets – hot water on one side, cold water on the other.And what I won’t miss about the journey home. This is really not about Europe, but I will not miss the Newerk Airport. I am sure I will have to fly through you again, but today you have let me down. Bulk loads of Nutella to smother all over the croissants. Beachy Head. We loved Beachy Head. Dave says he’ll miss Marmite. I do not believe him. I will and I will not miss the parallel universe, and overly reserve, polite people. And about today, it is not over, and we are about to board another plane. We had breakfast in Belfast. On the drive to airport, we joked about the Utah pronunciation of the word mittens pronounced, mih’ ins. We promised to name our pet Mih’ ins (if we ever get one). I was totally thrown at Belfast Security when they sent Eli’s jams through the x-ray another time. That is where we kept the jam(s), and somehow my very lovely toiletry bag did not return to my backpack. Arhg! I caught my breath and while walked over to see if Dave heard, the lovely ticket agent quickly went across the way, and called a supervisor over to talk to us (we found out who she was calling moments later).True story. Shereen R. was using her knowledge of the system to bully us, the customer, and to avoid responsibility . She should have just apologized, helped us and moved on. Instead, she lied and undermined our credibility. This is one of the reasons why I think airports are no longer places to feel free or safe, especially as the customer. We really are powerless, and it is their (stealthy and practiced) word against ours. The three other lady agents are not without blame either. They knew Shareen was wrong. Instead of helping us, they covered themselves, and went back to work. Yet before I called out the ticket agent, instead of helping all the customers, they thought it was ok to stand in our path and complain about us. It is my understanding that a ticket agent is a customer service job. Apparently I am wrong. By calling a supervisor over (Dina), Shareen cut me off at the pass, saving her own bacon. Instead of saying that what she did wasn’t cool, she created a drama that did not exist. Honestly, we were so tired and worn down. We know airports. We were actually were calm and nice. Because Shareen was protecting herself, the supervisor kept waiting for us to strike. We did not. After a few seconds the supervisor could see that we were harmless. We were simply confused (like I said), and caught in the path of a ticket agent, who apparently, has a problem with personal responsibility and integrity. Her reaction was bizarre and also calculated. She knew what to do to avoid punishment and what she did was sicl. She has the power. We were no one really. Just people who got in her way. So gross! And because of the police state airports have become, there was really nothing we could do. Dina, the supervisor, promised to call both the United Lounge and Customer Service. We stopped at both. Neither knew who we were. Customer Service was useless. They did not listen. 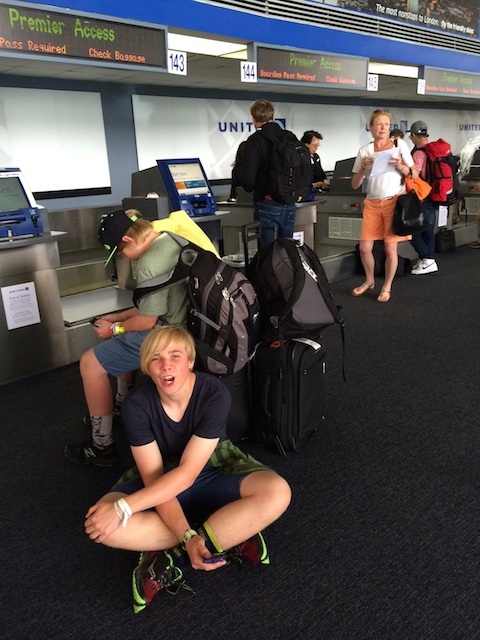 Our original concern: “can we get on an earlier flight?” United Airlines, you blew it. Shame on you! We found a Smash Burger in the airport. I finally ate. I talked to two very lovely men in the United Lounge. Renewed my faith in humanity. Reminded me of Brian and Robbins, my favorite, favorites, who really do make the world a better place. Oh hey and my brother Bill just called. I told him not to hold me to anything I say in this conversation. I’ve been up for awhile. The boys are good. Dave is settling back into the work groove and we are very excited for the next leg of our journey. I tried and I tried and I tried to post the post from Newerk. Alas, I could not, so here it is from Los Angeles. Today is a new day. After twenty-four hours of travel, at midnight, we arrived at our hotel. Sure, once we arrived they had lost our reservation. After watching Eli pass out on the hotel couch, Brian, the front desk guy, took pity on us. In on fell swoop, and a few calls, the hotel went from full to one room left. High fives to that! Dave was up at 3:45 AM for his 6:00 AM flight, and is already back in San Francisco. And from our Los Angeles hotel room I am already knocking away at all the things we missed while we were away. It is nice to be back in the United States. Sure, everyone came to the hotel breakfast in flip-flops and sweats, and a lady stole Kyle’s pancake right out from under him because and I quote, “is going to miss her flight.” I am curious. What do pancakes and morning flights have to do with anything. And yes, it was literally the last pancake, by the way. Anyway, we are home (sort of). As I reach for my adaptor, Eli reminds me that those plugs, plug right in. We enjoyed the journey and are very glad to be back. Forgive my delayed response. That is too bad about Tracy. Hope your London trip is a success!